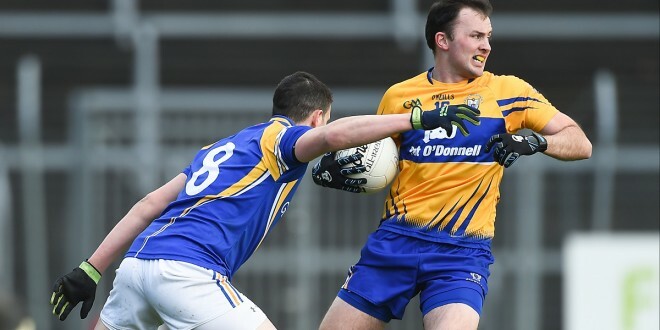 David Tubridy of Clare in possession against Darren Gallagher of Longford during their National League Division 3 Round 6 game in Cusack park. Photograph by John Kelly. AN outstanding display of point taking helped the Clare footballers to a comprehensive win over Longford in Ennis on Sunday afternoon. This eleven point win, played in front of a disappointingly small crowd of 1,226, has taken Clare to the verge of promotion to division 2 for the 2017 season. They play already promoted Kildare away on Sunday. Clare sit on eight points currently, two points behind Kildare and two ahead of Tipperary, Offaly and Sligo, all of whom are tied on six points. Clare might even win promotion if they lose to Kildare but a draw would guarantee it. Having started tentatively, Clare ended up leading narrowly, 1-7 to 0-6 at at half time. They played into the wind in the opening half and along with their opponents, Clare were slow to settle. Longford’s Michael Quinn goaled in the sixth minute for the opening score of the half, following a Barry McKeon pass after Clare had lost possession trying to emerge with the ball. Both teams missed reasonable scoring chances in that opening half but when Clare got going they put over some nice scores from David Tubridy, Jamie Malone, Eoin Cleary and Cathal O’Connor. Tubridy also scored Clare’s first half goal thanks to a calm finish and superb set up play involving Keelan Sexton and Gary Brennan. That goal really settled Clare and they played more composed football in the first half after that. However they lost a key defender in Martin McMahon just before half time, when he was black carded for a foul on Longford’s Diarmuid Masterson. 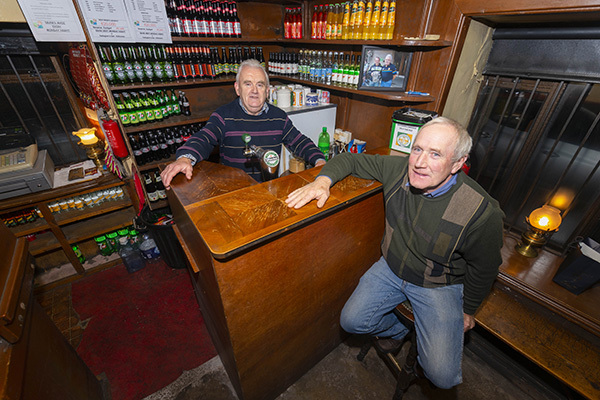 The Kilmurry Ibrickane man was replaced by Dean Ryan. Clare needed a big second half display if they were to put themselves in line to win promotion and they delivered their most impressive 35 minutes of 2016. They outscored Longford 0-13 to 0-3 in that second half and in fact Longford didn’t manage an additional score until the 31st minute of the second half. In the interim Jamie Malone, who started wing back but was moved to wing forward, put over three second half points, following his two in the opening half. Eoin Cleary also put over 0-3 from play in that second half while Pearse Lillis banged over 0-2 from wing back. David Tubridy tagged on 0-3, 0-2 from play, while the exceptionally hard working Keelan Sexton also raised a white flag as did Shane McGrath. Podge Collins was introduced 15 minutes from time and looked busy. This was an outstanding Clare display and they simply obliterated Longford, who could not match Clare anywhere on the field. A similar performance against Kildare and Clare will be promoted to division 2. Clare: Joe Hayes (Lissycasey); Seánie Malone (Miltown), Kevin Harnett (Meelick), Martin McMahon (Kilmurry Ibrickane); Jamie Malone (Corofin), Gordon Kelly (Miltown), Cian O’Dea (Kilfenora); Gary Brennan (captain), Cathal O’Connor (Coolmeen); Seán Collins (Cratloe), Eoin Cleary (Miltown), Pearse Lillis (Cooraclare); Keelan Sexton (Kilmurry Ibrickane) David Tubridy (Doonbeg), Pat Burke (Kilmacud Crokes). Subs: Dean Ryan (Éire Óg) for Martin McMahon (BC – 35), Shane McGrath (Thomas Davis) for Seán Collins (43), Podge Collins (Cratloe) for Pat Burke , Enda Coughlan (Kilmurry Ibrickane) for Keelan Sexton (55), Seán Haugh (O’Curry’s) for Seánie Malone (58), Jack O’Dea (Kilfenora) for Gordon Kelly (61). Scorers: David Tubridy (1-5, 0-3f), Jamie Malone (0-5), Eoin Cleary (0-4), Pearse Lillis, Keelan Sexton (0-2 each), Cathal O’Connor, Shane McGrath (0-1 each). Longford: Paddy Collum; Diarmuid Masterson, Barry Gilleran, Colm P Smyth; Donal McElligott, Dermot Brady, Dessie Reynolds; Darren Gallagher, Michael Quinn (captain); Robbie Smyth, James McGivney, Barry McKeon; Mark Hughes, Brian Kavanagh, Brian Farrell. Subs: Shane Doyle for Barry McKeon (half-time), Shane Kenny for Darren Gallagher (48), Paul McKeon for Mark Hughes (50), Larry Moran for Robbie Smyth (51). Ian Farrelly for Dessie Reynolds (61). Scorers: Brian Kavanagh (0-6, 0-5f, 0-1 ’45), Michael Quinn (1-0), James McGivney, Brian Farrell, Diarmuild Masterson (0-1 each). Yellow card: Robbie Smyth, Brian Kavanagh.